Why do we need salvation? How do we get it — and when? What do we receive when we do obtain it? WHY DO we find many religions in the world? Some people today say that religion is merely a superstition. And others today spread propaganda that religion is the opiate of the people! But MOST of the people in the world embrace some ONE of the world's many religions! How many of them ever stop to ask, sanely and candidly, why? Why do they need religion — and what does it offer them? Of all the world's great religions, the only one that offers forgiveness of sin and salvation is the Christian religion. The sin question and the receiving of SALVATION is the very heart and center of the Christian religion. But just what is this thing that is called "Salvation"? It is something everybody (who knows anything about Christianity) has heard about — and yet, do you realize that almost nobody — even of those who profess the Christian religion — really KNOWS what salvation is! A man 82 years of age, who had been for many years an elder in one of the major Christian denominations, came to me once and said: "I have heard many hundreds of sermons about Christ, and about salvation — but in all my 82 years of life I have never heard one explanation of the plain WHYS and WHEREFORES of SALVATION. What is this thing we call salvation, anyway? WHY do we need it? How do we get it, and when? And what do we get, when we get it, anyway?" Those things he asked me. In his 82 years this man had never heard a plain and a simple explanation that made it clear. Many of you have heard sermons about salvation, but not many OF YOU have ever heard a plain, clear explanation of just what it is, why you need it — and most of you have been deceived and unconsciously misled about how to obtain it! The HOLY BIBLE is the only textbook of the TRUE religion of the Creator GOD, as brought and revealed by Jesus Christ. You can prove that! And you can prove that the Holy Bible is the inspired revelation of the Creator who created this earth and put life upon this earth; who is the very source of life, the Supreme Ruler of the entire universe. Now the prophecies of the Bible say very plainly that all nations — with their many religions — are today deceived; and that even among professing Christians, it is the many who have been deceived — who have turned away from the truth, and accepted fables. It's time that we wake up and realize the state of religious affairs in this world today! It's time to wake up to the fact that pagan doctrines and practices began, even 1900 years ago, creeping into Christianity — and that today most of us have been reared from childhood in the assumption that these pagan teachings and practices are true, and that they came from the Bible. Most of you have never known any better. Why should you? — you haven't taken the trouble to look into the Bible for yourselves to see just what it does say! Now let's see if we can understand plainly and clearly just what are the whys and wherefores of this thing called salvation. The sole authority on this subject is the Bible. If the professing Christian world has turned from the truth (and remember that the Bible is TRUTH), and if it has turned to beliefs of MEN, then you must expect that what you are going to find, in the Bible, will be DIFFERENT from what you have been led to believe the Bible says! Yes, it's going to be very surprising, so prepare yourself for some surprises — and expect to find something different from what you have believed! The Apostle Paul, who was the Apostle to the Gentile nations, under inspiration of GOD, instructed the young evangelist Timothy how to find the true way of salvation. You will read of that in II Timothy 3:15-17. "From a child thou hast known the holy scriptures." The only Scriptures that Timothy had known from a child were those that we call the Old Testament Scriptures. None of the New Testament had been written when Timothy was a child. "From a child thou hast known the holy scriptures, which are able to make thee wise unto salvation through faith which is in Christ Jesus." Then he continued: "All scripture is given by inspiration of God, and is profitable for doctrine, for reproof, for correction, for instruction in righteousness." "Beloved, when I gave all diligence to write unto you of the common salvation [he was writing about salvation], it was needful for me to write unto you, and exhort you that ye should earnestly contend for" — what? "for the faith which was once delivered unto the saints. For there are certain men crept in unawares." This was before 90 A.D., before all of the Bible was even written. Even then there were "certain men crept in unawares, who were before of old ordained to this condemnation, ungodly men, turning the grace of our God into lasciviousness [license to do what you please], and denying the only Lord God, and our Lord Jesus Christ," turning men away from THE WAY of GOD into the ways that might seem right to men. Let us go back to the faith once delivered unto the saints, for it is only the Holy Scriptures which are able to make us "wise unto salvation." In them, in the Scriptures, we are to find the faith which was once delivered! All Scripture is INSPIRED of GOD —and is profitable to CORRECT us where we have been in error! So you can expect some correction in what you have believed! First, what does this word "SALVATION" mean? The expression "to be saved" means TWO different things: 1) Deliverance from trouble or danger; deliverance from sin and its consequences, from DEATH. We often hear of the expression "to save someone from a house that is on fire." You would want to be saved, to be rescued from the penalty of sin. 2) Salvation means to preserve — to keep, i.e., to keep us alive eternally by the GIFT of eternal LIFE. "The wages of sin is death." That is the wages you're going to collect for sinning. Death is the thing that stares you in the face, that stares every man in the face. "But the gift of God is eternal life." You do not now have eternal life abiding within you! It is a free gift of God, and you don't have it unless you obtain it. "The gift of God is eternal life through Jesus Christ our Lord." You need deliverance from the eternal DEATH penalty that you already have incurred — from that everlasting punishment, which is death, that you have brought on yourself as the penalty of violating God's Law. Everyone has sinned and brought that penalty upon himself. In order to be delivered from total and eternal death, in order to save your life — that is, to KEEP or to PRESERVE you ALIVE forevermore, and throughout all eternity, you need to receive the gift of eternal life, because you do not possess it from natural, human, fleshly birth. It is not inherent in you — and it can COME to you ONLY as a divine GIFT from God! What do you need to be saved FROM? From the penalty of sin. To be saved FROM the penalty of sin, you must stop sinning. But how can anyone stop sinning, unless he knows what sin is? Most people SUPPOSE that sin is doing something that you think is wrong — that hurts your conscience. Many seem to think that sin is the BEST way to live, but which a harsh and stern God denies us — the forbidden fruit which is really sweeter. They think God isn't quite fair. All right, now answer this: How many sermons have you ever heard in all of your life, explaining FROM THE BIBLE what sin IS? How many sermons have you ever heard giving you the Bible definition, reading right from the Bible, "SIN is . . ." and then giving you the definition of what it is? How many have you ever heard to read, right out of the BIBLE, the BIBLE definition of sin? Not very many, I'm sure! No, it usually is just taken for granted that everyone automatically KNOWS what sin is — it is almost universally assumed that sin is doing what YOU THINK is wrong —or what society or each church denomination says is wrong — or that which troubles your CONSCIENCE! But the Bible says "there is a WAY that seemeth right unto a man, but the end thereof are the ways of death" (Prov. 14:12; 16:25). Your Bible says that what seems right to a man is the way that will end in DEATH; therefore it is the way of sin. What one man THINKS is wrong, another thinks is RIGHT. And what hurts one man's conscience will not disturb another man's conscience at all! Millions of people today believe that sin is the more DESIRABLE and ENJOYABLE way — the way that is BEST for us, and so they put off turning from sin just as long as possible. They want to EN JOY sin right up to the last minute, and then get in on a death bed repentance just before they die! Exactly what is sin? Here is the plain Bible answer: "SIN is THE TRANSGRESSION OF THE LAW" (I John 3:4). Sin is what God, in His Law, says is wrong! Repentance means we quit breaking God's Law! To understand the plain whys and wherefores of salvation, we need to be corrected, first of all, on two points: 1) that God created man MORTAL, not IMMORTAL, and 2) that God's inexorable spiritual Law is GOOD, and that sin is the transgression of that spiritual Law that God set in motion. "And God said, Let the earth bring forth the living creature after his kind, cattle, and creeping thing, and beast of the earth after his kind," that is, they would reproduce in the same form and shape, the SAME IMAGE, the same likeness, so that each calf looks just like its mother before it. They reproduce after their kind, the same form, the same image, exactly. "And God said, Let us make man in OUR IMAGE." Here, the word for God is Elohim, and it's a uniplural word. This was written, originally by Moses, in the Hebrew tongue thousands of years ago. The word translated into the English word God is, in the Hebrew language, Elohim. Elohim is uniplural. It means more than one person. In other words, one family, a kingdom of persons; one kingdom, but more than one person. Only one God, because Elohim is not a person. GOD IS A KINGDOM! God is a Family! We have the mineral kingdom and we have the plant kingdom and the animal kingdom. There is an angel kingdom that God created, and then high above all is the Creating Kingdom, the GOD KINGDOM. In the God Family there is the Father. Jesus Christ is called the Son of God, and we can become sons of God. There is a Father and a Son — a family relationship. And so, God is more than one person. "And God said, Let us make man in OUR image, after our likeness" [the same form and shape], after OUR kind. "And the Lord [Eternal] God formed man of the dust of the ground," not out of spirit. He formed man of the dust of the ground. Man is dust. "Unto dust shalt thou return," said God to the first man. "And [He] breathed into his nostrils the breath of life," just as He had done into the nostrils of animals. Man, too, became a living soul; not that man has an immortal soul, but he became a living soul. The Hebrew word for "soul" is nephesh. It means "the life of animals, animal life, mortal life that is certain to die." That is the meaning as Moses wrote that word. So man has NO IMMORTALITY. Man was made flesh and blood — the same as ANIMALS, and he is considered to be in the animal kingdom, mortal, subject to death. "And the Eternal God planted a garden eastward in Eden; and there he put the man whom he had formed. And out of the ground made the Eternal God to grow every tree that is pleasant to the sight, and good for food; the tree of life also in the midst of the garden." There was the tree that would have given the man immortality. He didn't have immortality, but it was made available in this garden through the tree of life. There was also another tree, the tree of the knowledge of good and evil. "And the Eternal God took the man, and put him into the garden of Eden to dress it and to keep it. And the Eternal God commanded the man, saying, Of every tree of the garden thou mayest freely eat." That included this tree of life and immortality. "But of the tree of the knowledge of good and evil, thou shalt not eat of it: for in the day that thou eatest thereof thou shalt surely die." Man possessed FREE MORAL AGENCY. God made man a FREE MORAL AGENT. Man had to CHOOSE. The very fact that God said, "in the day that thou eatest thereof" — the very thing God condemned and forbade him to partake of — means that God allowed him to do it. God said later to His people, "I have set before you life and death," the right way of living, and the wrong way, "blessings and curses." He said to man, "CHOOSE!" He commanded the man to choose the right way, but He allows man to choose disobedience and the wrong way. That's what God allows, and that is precisely what man has chosen. God is the Supreme Ruler! God has decreed, as the Supreme Ruler, that man must CHOOSE. Man must make his own choice whether to obey God, whether to OBEY the laws that God set in motion, or whether to Disobey. God is the Creator, not only of the LIFE of man and animals, but God is the Creator of force, and of energy and of every LAW that exists. God also set spiritual laws in motion that regulate man's happiness, that regulate man's relationship with his Maker, with his Creator, and with his neighbors. That Law was given in LOVE, and that Law is LOVE. It's the very essence of love. It is the very principle of God's nature. It is love toward God, so that we can have the blessings of God, and the things that we need to receive from God. It is love toward our neighbor so we'll be kept in a right relationship with our neighbors, and have peace and be happy. That's the law that God commanded man to obey. And when man breaks that law, man brings heartaches and headaches, and he brings every kind of wretchedness and unhappiness that this world has reaped because of its Disobedience to God. "And the Eternal God said, Behold, the man is become as one of us, to know good and evil: and now, LEST he put forth his hand, and take also of the tree of life, and eat, AND LIVE FOREVER . . ." If man had taken of that tree, he would have lived forever, "therefore the Eternal God sent him forth from the garden of Eden, to till the ground from whence he was taken. So he drove out the man; and he placed at the east of the garden of Eden Cherubims, and a flaming sword which turned every way." Why? "To keep the way of the tree of life" — lest he go back and gain immortality. The man did not have immortality. He did not have eternal life. He was born subject to death. God said that when he took of that wrong tree, he would die; and men have been dying ever since. From that very minute mortal man was cut off from contact with God! He was cut off from access to the Spirit of God and the gift of eternal life! God imparted precious and sacred knowledge to the first man, knowledge of what man is, knowledge of GOD and contact with the Creator. But observe. Man rejected God's knowledge — and God allowed man to go his own way. He has been allowing it ever since. God set apart 6,000 years for man to go his own way. That 6,000 years is just about up! But we're still rebelling against God, and the way of God, and the way that would bring us peace, happiness, joy, and everything that the human heart really wants and desires. Later, humans multiplied and they spread out into different nations — cut off from God and from knowledge about the possibility of eternal life. Man then began to evolve His own religions, his own ideas. Man evolved and set in motion his own pattern of society — and his own kinds of governments — all cut off from God! Man set up ways on this earth and a civilization diametrically contrary to the ways of God — ways that would have brought peace to the world and happiness and prosperity to all of the individuals in the world. You people in the many different nations reading TOMORROW'S WORLD — you, too, are the children of this first man and this first woman, no matter what your nationality or your race. You, too, are mortal humans that were put here on this earth by the one Creator-God. You, too, were born cut off from God and from the truth about life, cut off from the way to peace, the way to happiness and the gift of eternal life. About 4,000 years after Adam, God sent His own begotten son, begotten by God as a human son, born of the virgin Mary. This Son of God was also a son of man, because He was born of a human woman. Jesus Christ was human. But Jesus had within Him that which Adam had REJECTED, and had been separated from — the HOLY SPIRIT of GOD! WHAT is this Holy Spirit that comes from God? It is the very SPIRIT — the very LIFE — the very essence, of GOD the CREATOR! God, according to John 4:24, is a SPIRIT, but man is mortal. Man is flesh. God is composed of spirit. Spirit is not like matter. Man is composed of matter. Matter occupies a definite amount of physical space, and has weight. But God's spirit emanates from Him, like the air — like space. It is force, it is power, it is life, it is character! When God's Spirit emanating from the very PERSON of God enters into a man, it IMPREGNATES that man with the very LIFE of GOD — it plants within that man or woman the divine nature of God, to develop the very character of God, until we, through His Spirit, become LIKE God — until we think as God thinks — until we see things with the same attitude as God sees them, and we act as God acts. Jesus Christ HAD the Spirit of the living God! And Jesus Christ was wholly OBEDIENT to the inexorable SPIRITUAL LAWS that God had set in motion. These laws are spiritual PRINCIPLES which regulate man's relationships and his happiness! Never once did Jesus Christ disobey, though He was tempted in every way as you and I. Never once did He sin — that is, never once did He transgress God's spiritual Law. Never did He bring the penalty — eternal death — upon Himself. Therefore, He was able to take on Himself your penalty and to pay it in your stead! Jesus Christ had received the gift of eternal life from God the FATHER! He did not have to die because of any penalty that He had incurred or brought on Himself. But because He loved all mankind — because of His great love for YOU, even before you were born — He GAVE His life for YOU. He permitted misguided men to nail Him to a cross — to pierce His side. He bled to death — dying IN YOUR STEAD, that by His SHED BLOOD ON THE CROSS, your transgressions of the LAWS OF GOD might be FORGIVEN! Jesus Christ had to die because you have transgressed the laws of God. Consequently, if and when you come to realize that sin is WRONG — and that God's laws are RIGHT and for your GOOD — and to REPENT of your disobedience of the Supreme CREATOR GOD — to fully SURRENDER to Him, and henceforth to be OBEDIENT to Him and to His laws, then you may in living FAITH accept Jesus Christ as your personal Savior from your own folly — and by your faith in His blood and His resurrection, your guilty past is forgiven. The penalty that you have incurred is paid in full by your Savior, Jesus Christ. You are then justified of your guilty past, and since there is no longer any disobedience to cut you off from God, you are reconciled to God the Creator. Contact with Him is established and thereupon God has PROMISED you the gift of His Holy Spirit. He has promised that He will implant within YOUR MIND His Spirit — His LIFE — HIS NATURE — HIS ATTITUDE — His very CHARACTER! By the very essence of the Holy Spirit of God you then become a BEGOTTEN CHILD of the living Creator God! Even then, you are still human. You still have your old human nature, also, and it will strive against this new nature of GOD which He has now implanted within you. You're not yet perfect as God is perfect. You are now only prepared to start to live a NEW life of GROWING spiritually — of DEVELOPING the very character of God — of resisting all the desires and impulses of the flesh, which your newly SPIRIT-led mind will reveal to you are wrong and in disobedience of the laws of GOD. You now start a life of growing daily into closer contact with God through daily PRAYER to Him — and through daily BIBLE STUDY of His inspired revelation of knowledge and of truth, the Holy Bible. You will encounter troubles, problems, trials and tests to try you, to develop CHARACTER within you. But now you will be close to GOD —and you can take all of these troubles to Him in prayer — and He will give you wisdom to know what to do — He will even change circumstances to bring you out of them. He will give you strength and power for deliverance and for mastery. Mortal man — cut off from God and the KNOWLEDGE that only God can reveal — has created his own religions, in which he has tried to assure himself that he already has immortality. Men, separated from the real truth which only GOD can reveal, originated the false idea of the immortality of the soul. There is no such idea to be found anywhere in the one Book through which God Almighty reveals the truth to mankind! Man is MORTAL — and the most certain thing in mortal life is that we shall DIE — unless we turn to GOD, repent of transgressing His ways of life, surrender unconditionally to Him, accept Jesus Christ as personal Savior, and gain contact with God the Father through Him! Now, how are we to be saved? A young man came to Jesus and said, "What good thing shall I do, that I may have eternal life?" And Jesus said, "If thou wilt enter into life," if you want to inherit eternal life, "keep the commandments" (Matt. 19:16-17). Peter said that the way is first to REPENT, AND THEN BE BAPTIZED, signifying faith in Christ. Baptism is the outward expression of that inner faith in Jesus Christ for the remission of sins. After baptism you are promised that you shall receive the gift of the Holy Spirit (Acts 2:38). Romans 8:11 promises that if the Holy Spirit dwells in you, God the Father, who raised up Christ from the dead, will also immortalize, or make immortal your mortal bodies by His Spirit that dwells in you. Turn now to 1 John 3:1, 2: "Behold, what manner of love the Father hath bestowed upon us, that we should be called the sons of God: therefore the world knoweth us not, because it knew him not." This is speaking of real Christians." Beloved, now are we the sons of God," yes, already begotten as sons of God when we receive His Spirit, "and it doth not yet appear what we shall be: but we know that, when he shall appear, we shall be like him; for we shall see him as he is." Do you know that Jesus Christ is now glorified in heaven as very God? His face shines like the sun in full strength. His eyes like flames of fire. We are to be like Him." Our vile body [is to be] fashioned like unto his glorious body" — to be glorified fully with Him, to enter into the God family, the very Family of God, the Kingdom of God, and be born by a resurrection into that Kingdom (Phil. 3:21). That is what salvation means. That is how you get it. These are the plain WHYS and WHEREFORES OF SALVATION. If YOU are ready to really REPENT of your disobedience to GOD — to His SPIRITUAL LAW; if you are now ready to SURRENDER YOUR WILL to God, and you want to become one of HIS CHILDREN — if you are now ready to accept Jesus Christ as your personal Savior in real living FAITH and live a life of OBEDIENCE, write and tell me. We have dedicated, consecrated, converted, fully instructed and trained, ordained MINISTERS in all parts of the world — available to call on you, visit you in your home, answer your questions, explain the Bible to you — IF YOU REQUEST IT! But none of them will EVER call on you, unless YOU of your own free will request it! Paul had visited the elders (ministers) at Ephesus from house to house — BUT, regarding the general public, Jesus said, "Go NOT from house to house" (Luke 10:7). Neither Jesus, nor Peter, nor Paul, nor any of the original true apostles ever approached people and personally URGED conversion on them. God has made every human a FREE MORAL AGENT. God compels each to MAKE HIS OWN DECISION, and the true GOD will never force you to be converted. But if you, of your own volition, want to know MORE about the Bible — if you'd like to ask questions about it, why not write to the Editor and request a personal visit? We may be able to have one of God's own ministers call on you quite soon. And let me suggest that you jot down on paper the questions you are going to want to ask. I've learned, personally, by more than 43 years' experience, that you'll forget them unless you do. 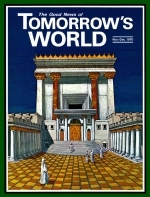 Hundreds and hundreds — yes, thousands upon thousands — are being converted — their lives CHANGED — by this WORK OF GOD, through The WORLD TOMORROW broadcast worldwide, through The PLAIN TRUTH, the Ambassador College Correspondence Course, through this magazine, TOMORROW'S WORLD, and other vital free literature we send upon request. But if you have any questions about the Bible, or the Christian LIFE, write me. I cannot call and visit with you personally any more (as I used to do and wish I still could), but God has now given me many truly called and chosen men who CAN.